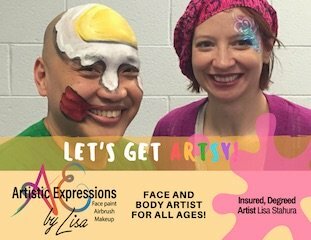 Welcome to Artistic Expressions by Lisa. I am a degree fine art that lives in the Chicagoland area where I started my art career. I love to help create memories for you to look back on from years to come. With my love for all things of beauty and my passion for perfecting my trade, I knew that the arts were my calling from a young age. I’m proud to offer my customers the very best in the world of face painting. Growing up, the arts was always a passion of mine, and I always admired those who eventually became my role models. I feel lucky to have made it into a blossoming career. As a professional based in Elgin, I’ve been helping clients look and feel their best since 2010. What sets me apart is the ease and convenience of my services, as well as a full commitment to high-quality services, perfectionism, and professionalism. If you have any questions about my services or my past experience, please don’t hesitate to get in touch. Check out my services and offers, and get in touch today to book a service or find out more. 25 reviews on thumbtack Hired 57 times with 5-star reviews to start.